SAF-HOLLAND is one of the leading suppliers of exemplary solutions for the global commercial vehicle industry. We contribute to the success of our customers’ businesses with our innovative components and systems. The story of SAF begins in 1881 in a German village blacksmiths’ with the invention of a new plough. The family business soon starts building the first steel axles for agricultural vehicles and under the name Otto Sauer Achsenfabik (SAF) develops itself into one of the leading manufacturers of trailer axles and suspension systems in Europe. Development, construction and production of the so-called “Zill Alternating Plough"
At the beginning of the company history of Holland is a safety coupling between horse and plough: In 1910 the Safety Release Clevis Company is founded in South Dakota, USA. With the move to Holland, Michigan, the company emerges as one of the largest suppliers to the commercial vehicles industry under the name The Holland Hitch Company. In 2006, the German Otto Sauer Achsenfabrik GmbH and the North American original equipment manufacturer for commercial vehicles, Holland Group Inc. merge to form SAF-HOLLAND, one of the leading suppliers for the global commercial vehicles industry. SAF-HOLLAND products impress both the vehicle manufacturer and their customers: fleets and trucking companies worldwide. They prove their outstanding product features in everyday transport business through quality, efficiency and service. The company intends to secure and continually expand on this success in the long-term. For this reason, SAF-HOLLAND pools its resources, uses its specialist know-how and optimizes the active cooperation of its entire workforce. Acquisition of specialists for bus suspension, Corpco Beijing Technology and Development Co., Ltd.
Sale of the Aerway product line to Salford Inc.
Acquisition of Brazilian suspension specialist KLL Equipamentos para Transporte Ltda. 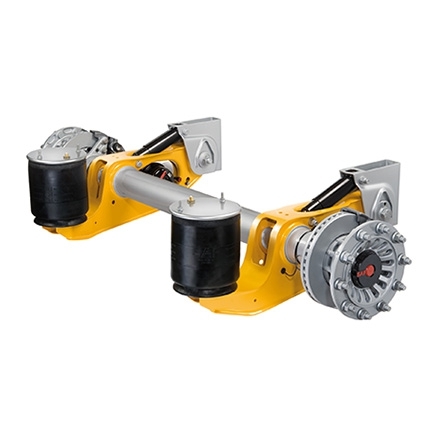 Acquisition of the trailer axle and suspension system manufacturer York Transport Equipment (Asia) Pte. Ltd.